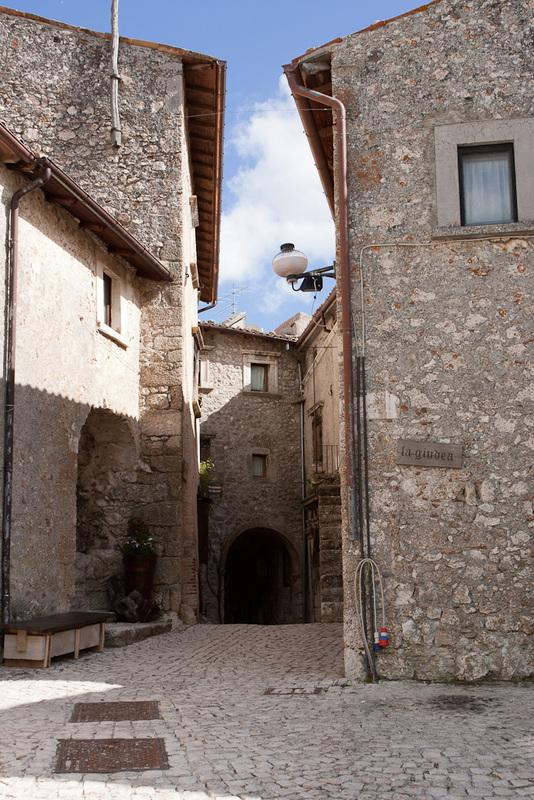 Today I have arrived in Santo Stefano di Sessanio, which is near L’Aquila. The mountains here are all around and as the bus left the outskirts of L’Aquila, medieval villages on hilltops came into view and olive orchards stretch away into the distance. It is beautiful, yet austere at the same time, and I have no doubt that life here is hard. Certainly in these times of financial crisis following on the earthquake that struck the region in 2009. Santo Stefano di Sessanio is one of the prettiest villages in this area and indeed Italy, but it was badly damaged in the earthquake and its trademark tower has collapsed, leaving a metal structure in its place. I imagine they will try to rebuild, but this will take time and money, of which there is not a lot around. A lot of support structures are in place to hold up the old buildings. I’m one of four people getting off the bus and the village looks completely devoid of people at this time in the afternoon. The signs for hotels and other accommodation look promising, but walking through the village I only find that things are closed up. It’s still early in the season here. In the small bar in the village I ask about accommodation and they tell me to come back in half an hour while they try to call someone. I walk on and find one hotel that is open, but they want 150 euro for one room and that is not exactly what I had in mind! I later find out that was actually a lot cheaper than their normal price, which is about double; I’m sure the rooms are spectacular – apparently it’s a very special hotel. Another place is fully booked with a school group. Eventually I come back to the bar and they have indeed found someone who has a room available and who is coming now to take me there. My new home for the night is called Residence Il Palazzo and is just outside the village on the main road. It certainly feels like a palace, the room is twice as big as what I had in Rome and it’s only 45 Euro including breakfast. It’s a historic building and the owner tells me he has almost finished with the renovations necessary after the earthquake. As I stuff my face with an enormous antipasto and homemade gnocchi he tells me the story of how he came to buy the property and how much work they have had to put in to get it to this stage. Just when things were about done, the earthquake happened and that set them back a bit. It looks like this summer business might be going well again. I really hope so for them. The dining room is really beautiful and the enormous dinner he serves with wine for 15 euro is a steal! A real serendipitous find.